Are you a vegetarian interested in reaping the many benefits of the ketogenic diet? Or maybe you already follow the keto diet but want to go meatless? Does it seem like all that time you spend on exercise just goes to waste? Perhaps you’ve tried other diets, but none of them seems to work? Trying to lose weight is a grueling journey but there is an answer that allows vegetarians to effectively shed those stubborn pounds. And the answer is this meal preparation guide! The keto diet can help fight various diseases and conditions like epilepsy, metabolic syndrome, some cancers, autism, Parkinson’s disease, obesity, and other autoimmune conditions. Dieters will experience a surge of energy and lesser headaches, fatigue, nausea, and confusion. The keto diet reduces your blood sugar and insulin levels which can be immensely beneficial for those suffering in type 2 diabetes. Drastically improve your brain function and alertness. And much more unexpected benefits! This meticulously crafted meal preparation guide provides you with worthwhile information into the most effective way to lose weight in a gratifying meat-free way. Those who partake in this 30-day keto vegetarian challenge usually report an unforeseen fountain of energy and rapid weight loss where the excess weight permanently stays off just from changing the way they eat. How to Safely Incorporate Vegetarianism with Keto? And much, much more useful information! 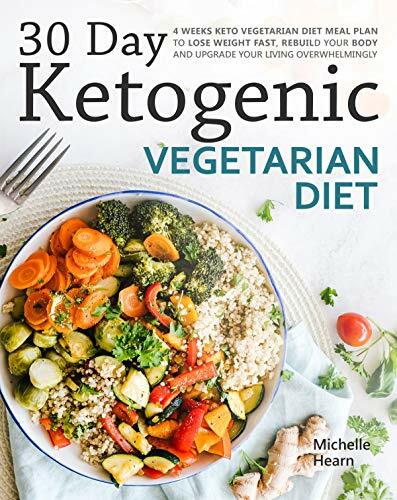 Grab this amazing 30-Day Ketogenic Vegetarian Meal Esbozo cookbook by now to live healthier and longer!